Traveler Thirteen and I headed out early this morning. 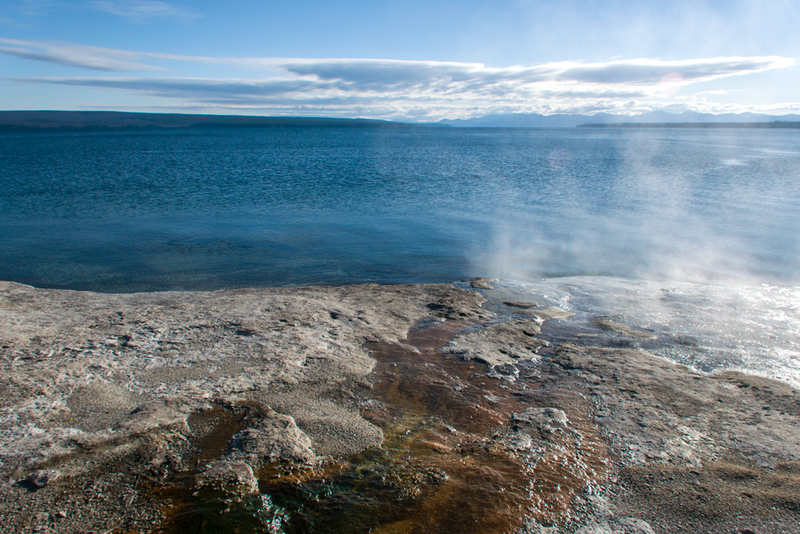 We wanted to beat the crowds to the West Thumb Geyser Basin. 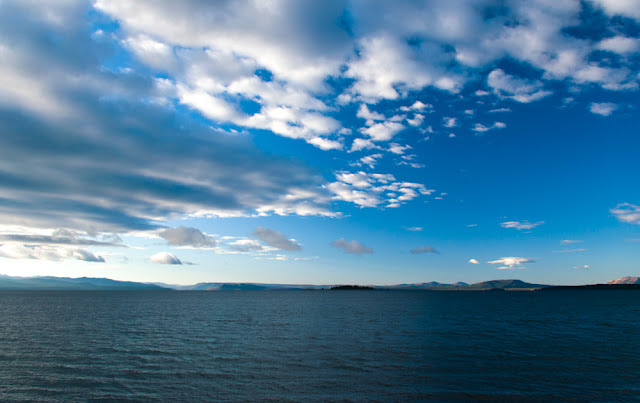 We headed west along the banks of Yellowstone Lake as the sun rose. 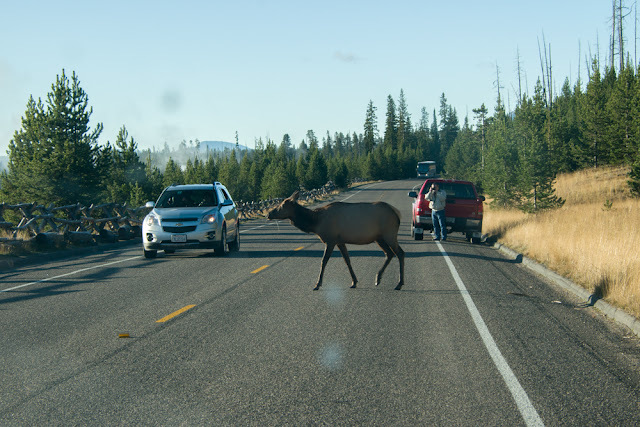 As we approached the West Thumb Geyser Basin we encountered an Elk Jam. Two cows with their babies were crossing the road. 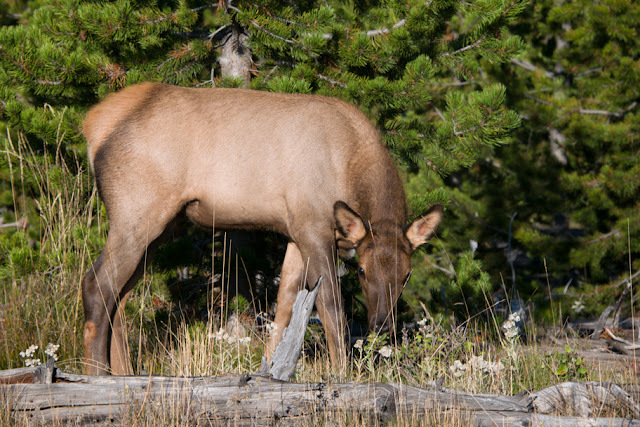 Mother Elk crossing the road. She and her baby would eventually jump the fence to the left. When we got to West Thumb there were already two bus tours there. We got firmly stuck between them on the walkways. 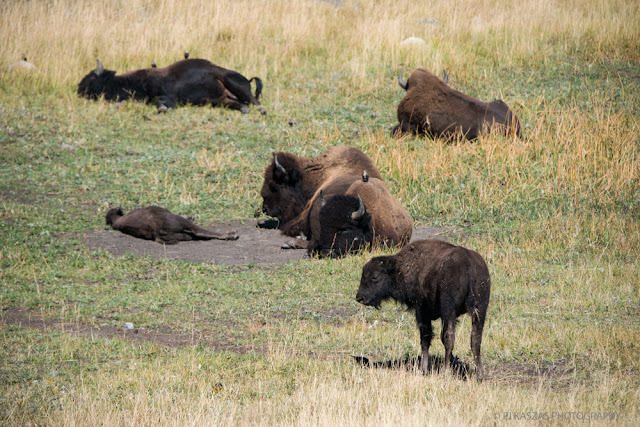 While everyone has a right to enjoy the park, when you are trying to take time to set up shots, especially of wildlife, people intent on getting selfies monopolizing areas and making lots of noise can get really tiring. I would have a rather uncomfortable incident with this later in the afternoon. We also heard a bull elk bugling in the distance. We hoped he'd make an appearance. The West Thumb Geyser Basin is a caldera within a caldera. 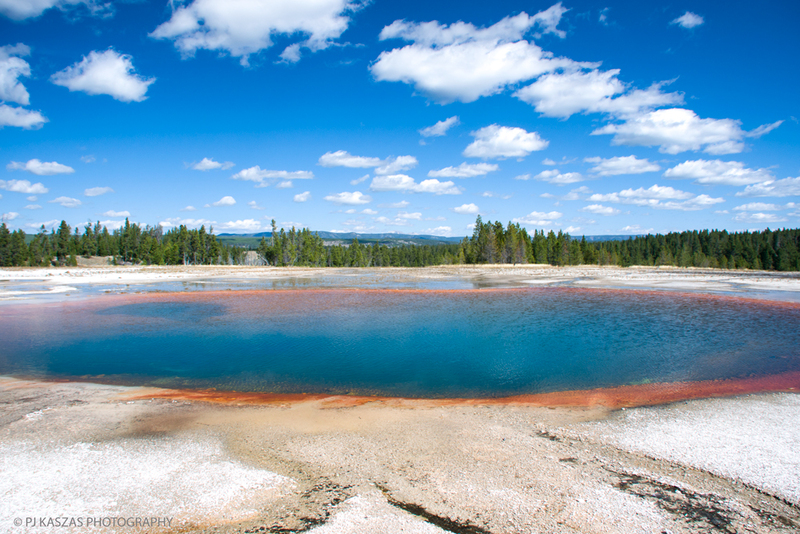 The Yellowstone caldera last erupted 600,000 years ago. 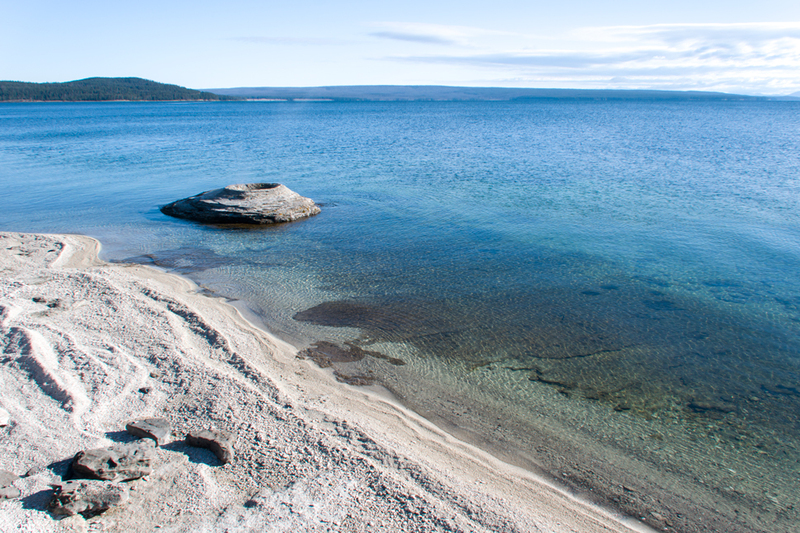 West Thumb was created in a smaller eruption around 150,000 years ago. The super heated water the supplies the West Thumb Basin originates around 10,000 feet below the surface. 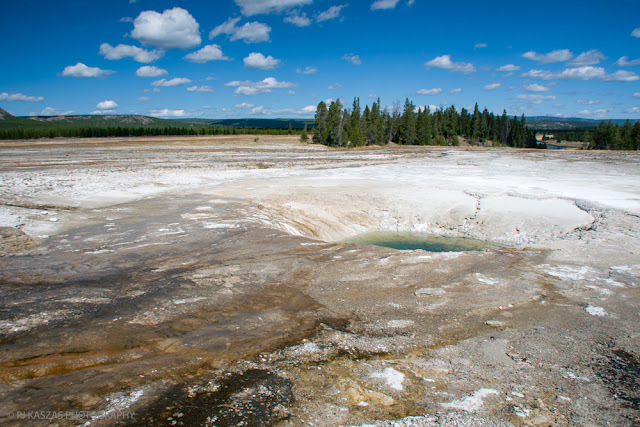 This is relatively shallow in comparison to other areas of Yellowstone. 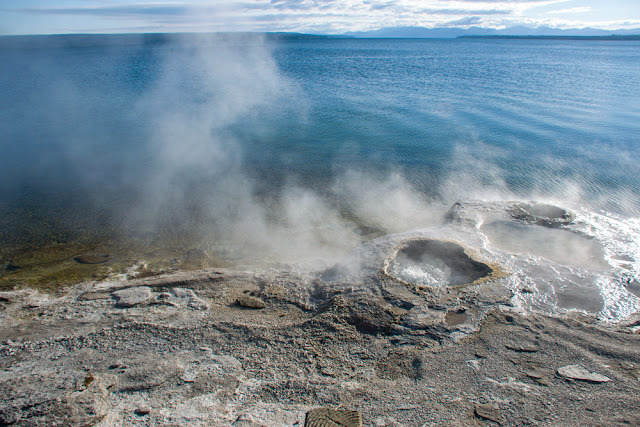 The basin pours over 3,000 gallons of water into Yellowstone Lake daily and the hot springs extend under the lake. Despite this, the lake temperatures average 45 degrees Fahrenheit. A note about the colors in hot springs: The colors are formed by thermophiles, heat-loving micro-organisms (usually various kinds of bacteria that form bacterial mats). These microorganisms have different colors and different temperature requirements. 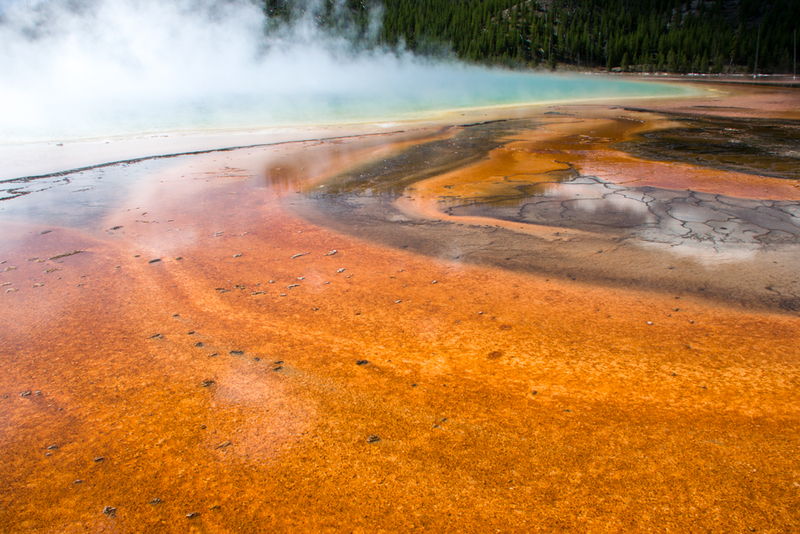 Green and brown indicate organisms living in cooler water, orange and yellow indicate those living in hotter water. Deep or crystal blue indicate places where temperatures are too high for living things. 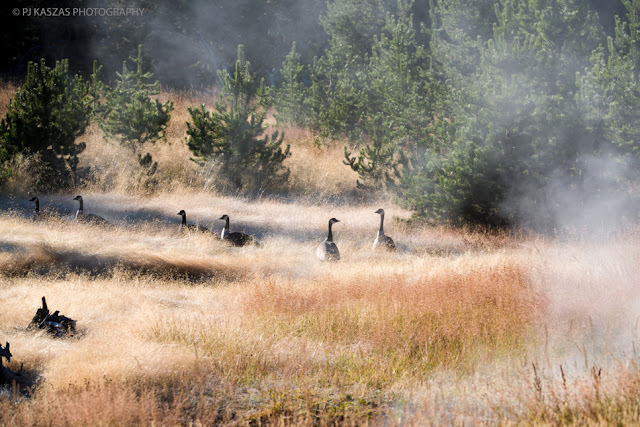 Canada Geese in the steam near Seismograph Pool. Near boiling water making its way into the lake. Lakeshore Geyser. This geyser used to erupt upwards of 50 feet. It hasn't erupted since 1970 but it does continually boil. 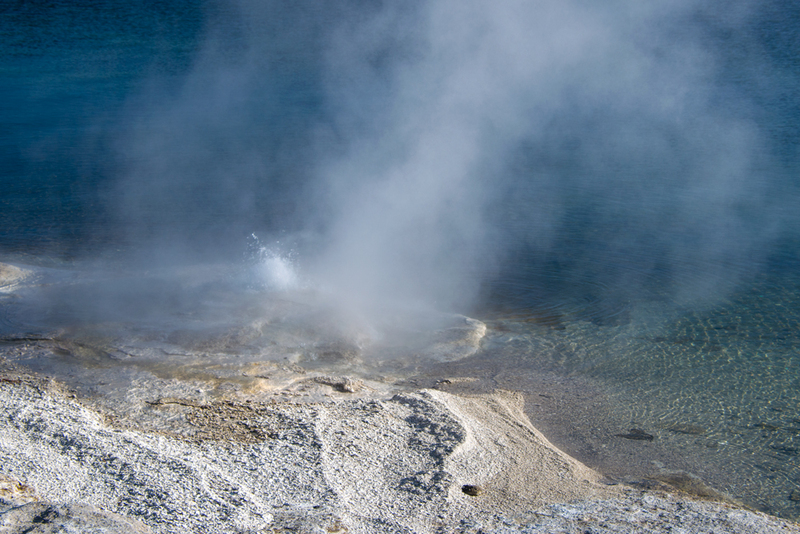 Future earthquake or volcanic activity could reactivate this geyser. Fishing Cone, thus named because many years ago people would actually cook the fish they caught in the lake in the boiling water of the cone. This is no longer allowed due to injuries sustained to both humans and the cone in the attempt. At 53 feet deep, Abyss Pool is one of the deepest hot springs in the park. I saw gray jays, sparrows, and some sort of warbler that I have yet to identify here. 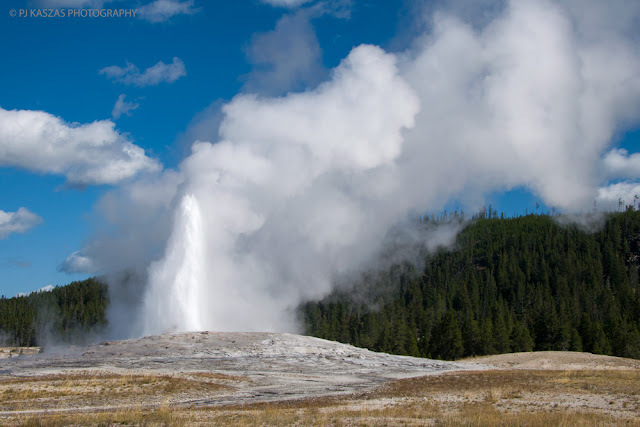 After leaving West Thumb, not without having to escape an awkward conversation with a man who had to keep commenting on the size of my camera lens (as a woman I find this hilarious), Thirteen and I headed northwest toward Old Faithful. We also kept an eye out for the bull elk we heard calling earlier but he wasn't feeling like being photographed this day. Old Faithful winding up to do its thing. We timed it just right to get there in time to take a quick wander through the spectacular Old Faithful Inn, one of the world's largest log structures, and then watch Old Faithful faithfully do its thing. It is really rather spectacular. 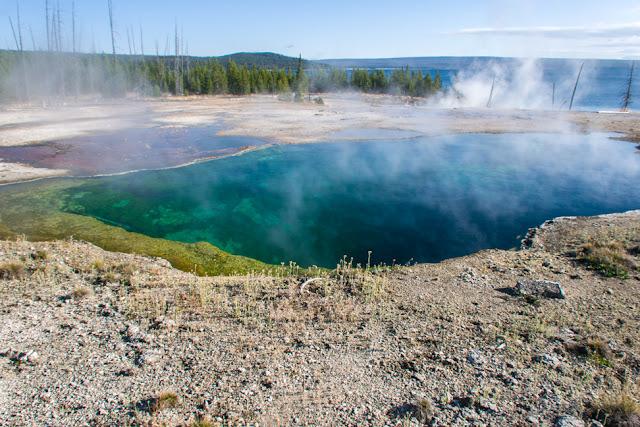 In Yellowstone you will find 60 percent of the world's geysers. The Upper Geyser Basin, where you find Old Faithful, holds the largest numbers of geysers in the park. 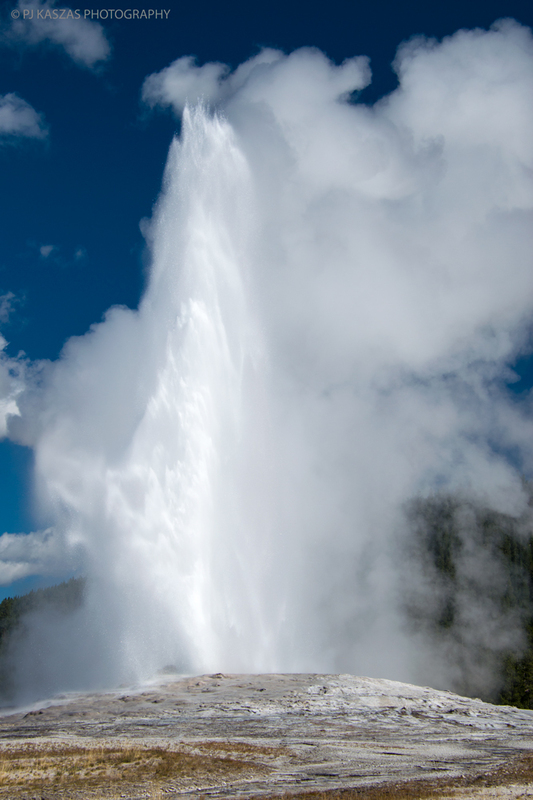 In one square mile there are at least 150 geysers, of which only five can be regularly predicted to fire. In any direction you look here the ground steams and boils. It's a powerful spot though you are standing in a place where the Earth's crust is oh so fragile. Thirteen and I then headed to the Midway Geyser Basin where the Grand Prismatic Spring, one of the most photographed geological features in the world, can be found. Rudyard Kipling immortalized this area by dubbing it "Hell's Half Acre." 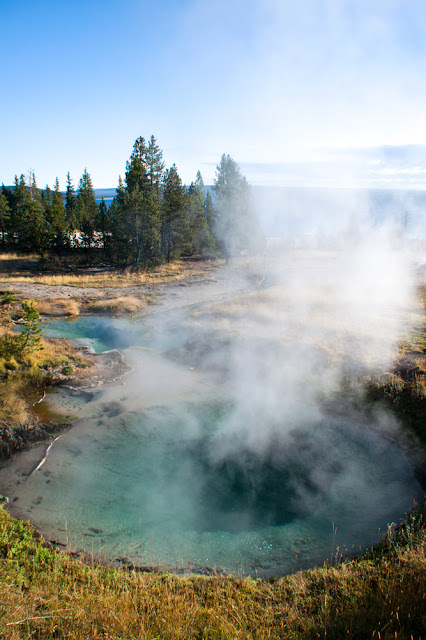 As you walk from the parking lot, you cross the aptly named Firehole River, where steaming near boiling water pours off this area where two of the world's largest hot springs can be found (Excelsior and Grand Prismatic). Turquoise Pool. 142 to 162 degrees Fahrenheit. Opal Pool. From some angles it looks like the entire world is getting sucked down into Opal pool. 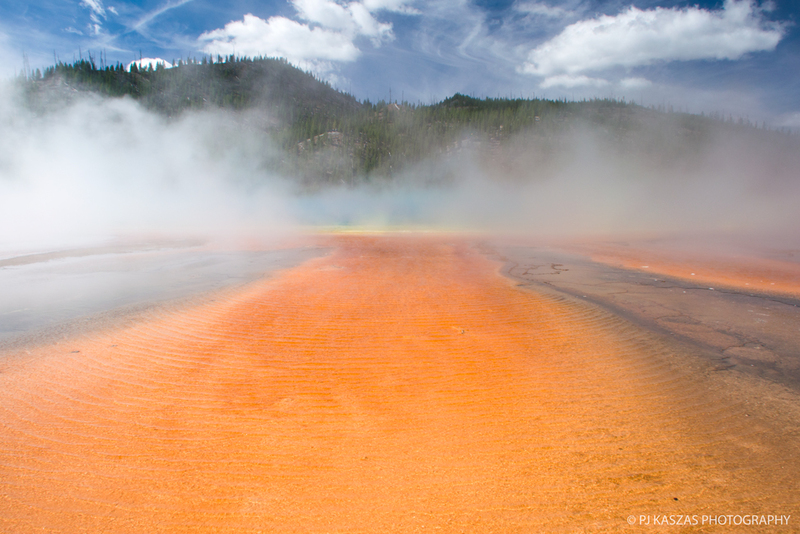 On a cool windy day like this day, the rainbow colors of Grand Prismatic Spring can be obscured by enormous amounts of steam. It's truly an amazing site. The colors of the spring get reflected into the steam and its mezmerizing. 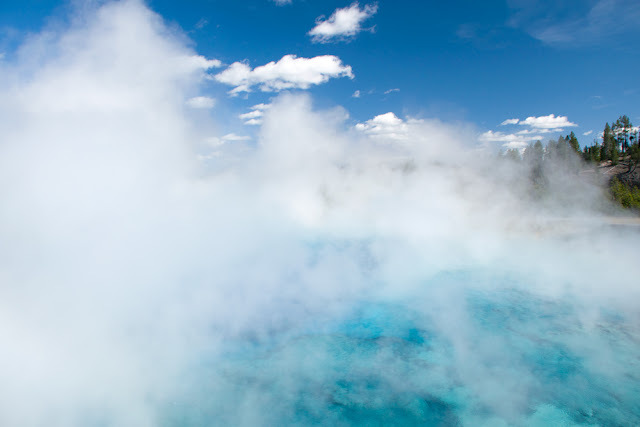 This is the world's third largest hot spring. The two largest are found in New Zealand. Yes, its really this bright. The blue/green is extremely hot and nothing lives there so it reflects back crystal blue. The yellow ring is a cyanobacteria called Synechococcus. 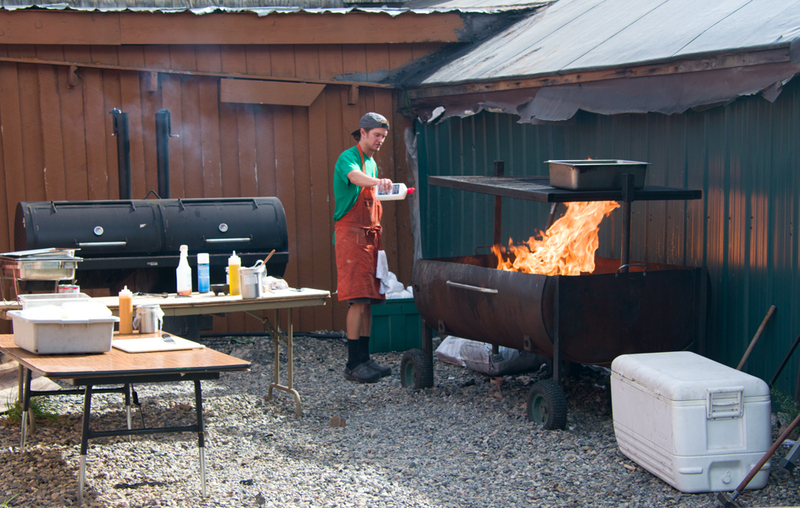 It survives in temperatures between 165 and 149 degrees Fahrenheit. Carotenoids give Synechococcus and other bacteria their color. In the orange colors Synechococcus is joined by Chloroflexi bacteria as the temperature lowers. And in the coolest parts, the red-brown areas other kinds of bacteria flourish and give those stripes their color. 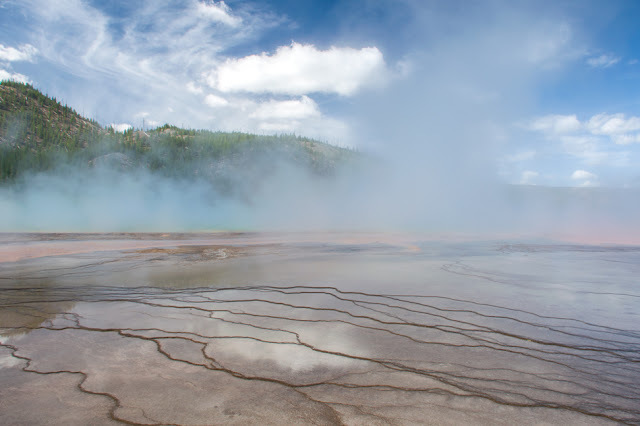 Grand Prismatic Spring. In the video below you can experience how much steam and how much wind was whipping at us. At one point I felt like we were going to be blown back to the parking lot. Indigo Spring confusing land and sky. There was a single buffalo hanging out right on the edge of the parking lot. I don't know why they choose to hang out in high traffic/high human areas. Someone explain this to me. 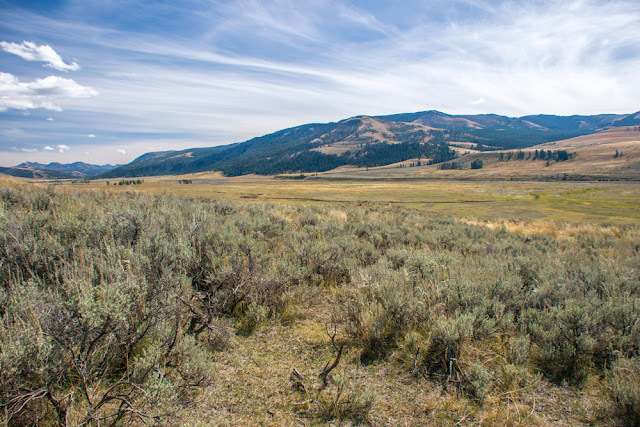 Our next destination was the Lamar Valley and then into Cooke City, Montana. 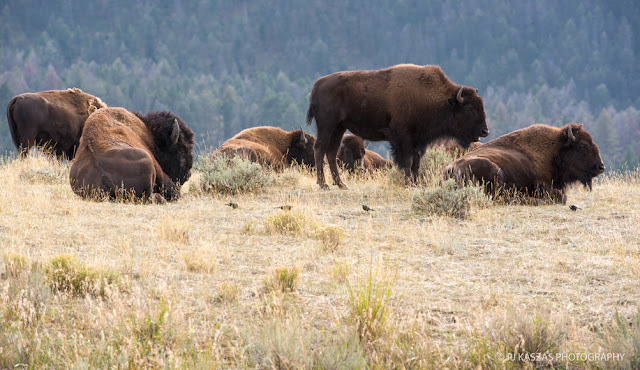 As we drove toward Canyon Village we passed one of the most magnificent bison bulls we would see. He was extraordinary. He was walking calmly down the side of the road. As he walked the woolly fluff on his legs flicked just like a strutting cowboy's chaps. This buffalo exuded confidence and charisma. He knew he was the king of that road. So when an idiot in a car behind us starting screaming about everyone driving faster and stop stopping taking photos because "there are like 30 more buffalo just up the road", Mr. Magnificent Buffalo chose that moment to walk into the middle of the road and stop right in front of the offending human and block their progress. Do not insult the king of buffalo. I do not have photos of this buffalo because I was driving. You can visit Thirteen's Flickr account. We stopped at Canyon Village for a quick lunch. The largest ravens I've ever seen were stalking humans for leftovers here. Amazing geology as you head past the Washburn Hot Springs Overlook and Dunraven Pass toward the Lamar Valley. Not a fantastic photo but it was the first time I got to see pronghorn males butting heads. Lamar Valley. 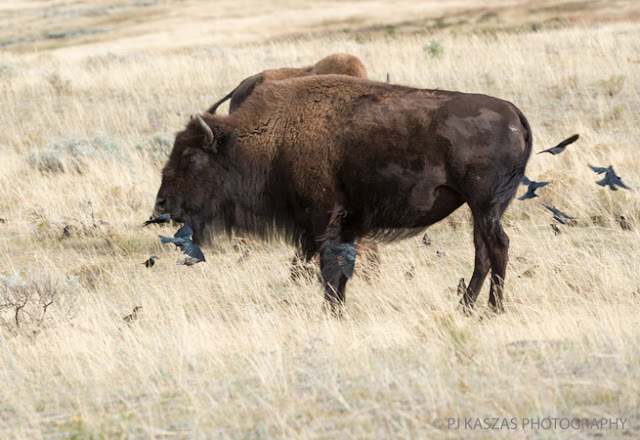 Buffalo and Brewer's Blackbirds. Taking this photo made me exclaim "Hey, I think Buffalo poop blackbirds." I think I'm the only one who finds this funny. Love the birds on bison backs. We went through Silver Gate into Cooke City, Montana. We stopped at a wildlife photographer's studio in Silver Gate, whose name I've now forgotten. 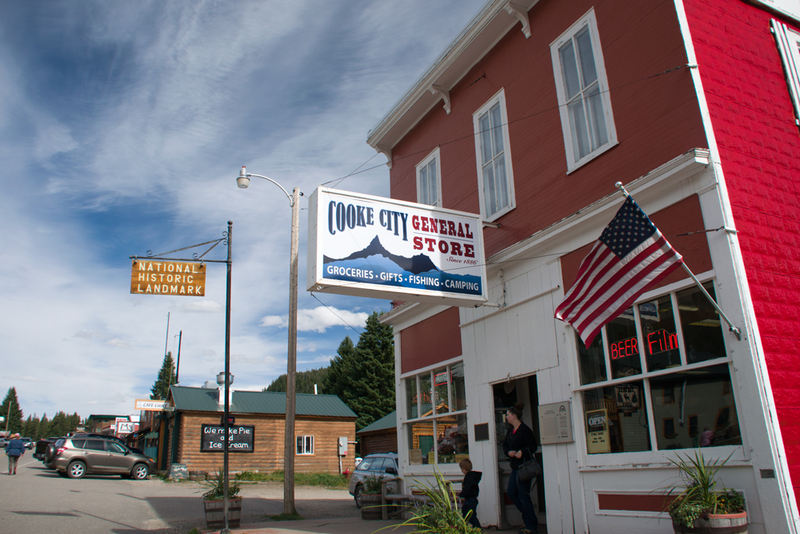 We wandered Cooke City for a snack. You can do this really quickly as the population is only 140. There's a visitor's center with a cabin and outhouse to explore. Main Street Cooke City, Montana. We then drove back through the Lamar Valley. We were losing the good light. But still its gorgeous. 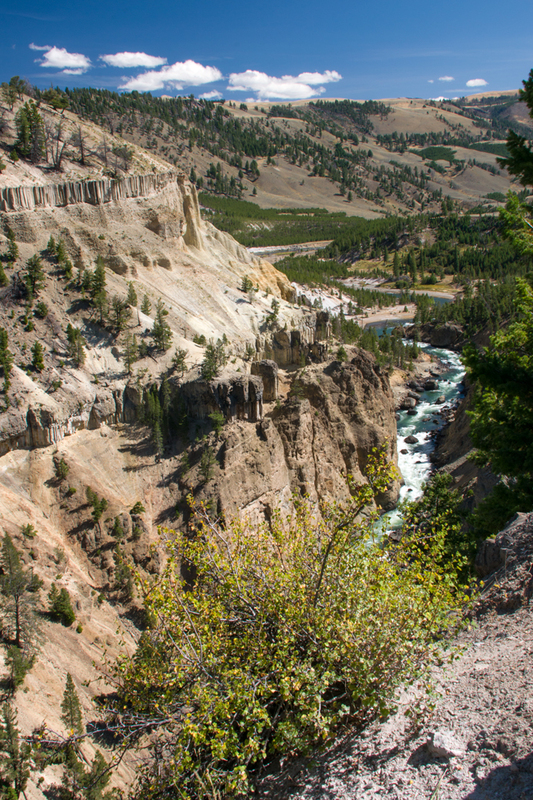 We made a brief stop at the Lower Falls of the Grand Canyon of Yellowstone. This needs to be photographed earlier in the day. But its pretty amazing. Unfortunately, my experience was marred by two women intent on taking selfies. They had taken their photos and moved to the side so Thirteen and I began taking a few photos. We were in that spot for maybe half a minute when one of the women started poking me in the arm with her finger. I looked up and one of the women signaled for me to step aside. I said, "One moment." I tried to snap another photo. Now her friend poked me in the arm and shoved me in the shoulder twice to make me move. My response was "We are trying to take photos too." They backed off but only slightly. Seriously folks, take time to enjoy what is around you. 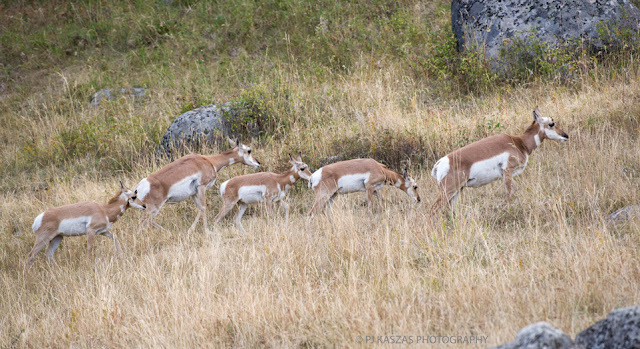 Be polite to fellow visitors and photographers. And ask yourself if you really need that many photos of yourself and your friends that you have to be rude and get physical with other people around you. 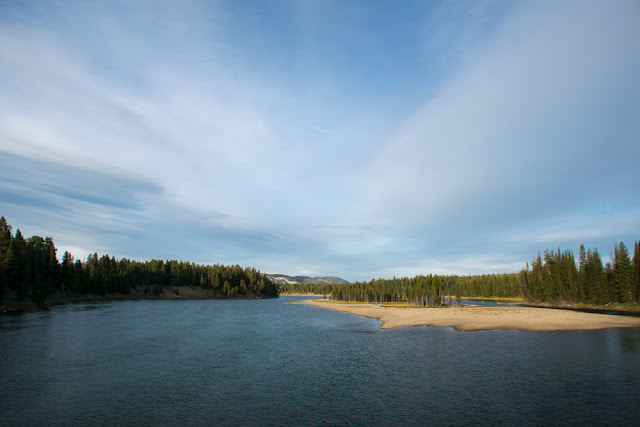 Yellowstone River near Fishing Bridge.